Julia Goerges defended her singles title at the WTA Tour's ASB Classic, ending the amazing run of Canadian qualifier Bianca Andreescu 2-6, 7-5, 6-1 in Sunday's final. Canadian teenager Bianca Andreescu came up one set short in an attempt at her first WTA Tour title. 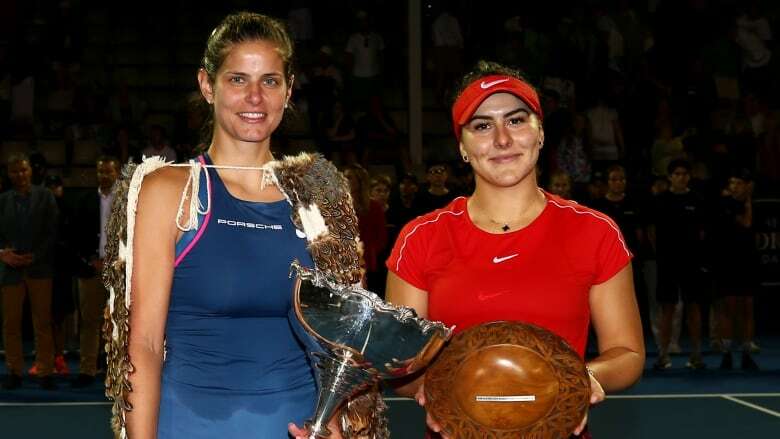 Julia Goerges of Germany beat the 18-year-old Andreescu 2-6, 7-5, 6-1 on Sunday in Auckland, New Zealand, to win the ASB Classic for the second year in a row. "It is disappointing, I was one game away from winning the match, so I'll probably be thinking about this for the next couple of days," said Andreescu, who earned entry into the tournament as a qualifier. "But I can't complain. I had an amazing week, I beat a lot of top players. I'm just really proud of myself." "This meant a lot," Goerges said. "I don't know what to say right now because Bianca gave me a hard time today. She played some terrific tennis, different from a lot of players on the tour and I'm sure we're going to hear a lot more of her." "It feels really good, I'm not going to lie," said Andreescu. "But I'm just trying to stay grounded right now, stay humble, and use it to my advantage." The duo beat Taylor Townsend and Paige Mary Hourigan 1-6, 6-1, 10-7 in the women's championship match. The $250,000 US WTA Tour event is a warmup for the first Grand Slam of the season.